It's Irie: The Crab Pot: Friend or Enemy? Every sailor in the Chesapeake Bay gets annoyed with all the crab pots, except, maybe, the ones familiar with sailing in the state of Maine. “You haven’t seen anything yet”, is their response after our complaints, “The lobster pots up north are way worse and all over the place!” Well, we weren’t going to Maine any time soon, and for now, the obstacles in the bay were numerous and intimidating enough. From the moment you leave the main shipping channel, you’re surrounded by crab pots. The channel calls for limited and less safe sailing because of the monstrous ships that use it, so smaller boats prefer to avoid these traffic lanes. Just when you have the sails adjusted and get ready to let the wind push you forward, the first floating devices appear. Before you know it, you’re in a real minefield of crab traps, and the dodging starts. Having the sails up doesn’t make things easier, and it takes a lot of concentration from skipper and crew to locate the next obstacle, avoid it, and don’t mess up the point of sail too much. Weaving around the crab pots finally brings you through the congested area in twice the time and the distance, but… it is good exercise. You sail freely for a bit, get into the swing of things again, your mood brightens, and there is the next patch of floating cages. The exercise starts all over again. What can happen when you do run over one? The whole device contains of a small buoy to mark the spot and to keep the pot floating. Underneath it is a line on which a metal cage is attached. When you drive over the ball, the line can get stuck in the propeller, and can cause major damage, especially when under power. A pretty bad prospect, and one that is likely to happen since there are so many crab pots around and they are not always easy to see, especially in bad weather and choppy seas. Some cruisers even invest in a line cutter to deal with this problem. So, we got annoyed with these things in the Chesapeake Bay, but at least they were located outside of the channel. On our trip south, following the Intracoastal Waterway, where you have to stay in the channel, we still came across some crab pots. Here we got really startled by them, since we didn’t expect them to be on our path. Most of the time, they were closer to shore and out of the channel. After a while we actually came to appreciate them. We figured out that they marked shoals and sand bars, and could almost use them as navigational aids. Part of the time, the crab pots became our friends while motoring and anchoring. They kept us from running aground. Other times they really restricted where we could drop the hook. Just when we had developed a balanced relationship with the ever present objects, we were in for an unpleasant surprise… On that particular day, the wind was refreshingly strong and finally came from a favourable direction. The perfect conditions for a wonderful sail south! This was the first and only day we could actually do what the boat was supposed to do. Irie had a delightful day, cruising along at almost 8 knots. 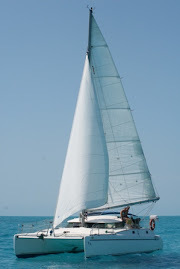 Mark was in heaven, the dogs had their nose pointed in the wind, it was fun to sail the catamaran, and we all felt great. All of a sudden, we slowed down… The wind was still blowing pretty hard and out of the same direction. Something was wrong. We had recently skirted a few crab pots at the last possible moment, so we had a sneaking suspicion we missed one. Looking behind, we saw something fluorescent that seemed to be following us. The port hull was trailing a huge cage. No wonder we lost our steady speed! Mark and I immediately started the starboard engine and lowered all the sails. With a boat hook, we managed to pull the heavy item in. Unfortunately, the cage was empty, so no free dinner for us. We cut the rope and sent the ballast to the bottom of the river. That’ll teach the crabbers to not put these things in the middle of the channel! What else were we going to do with the heavy case anyway? Then we tried to locate the floating device, but we were unsuccessful. Using one engine, we managed to anchor in the nearest spot. Later that afternoon, Mark braved the cold, dark and choppy water, to untangle the line from the rudder. We were very fortunate that the “pick-up” happened while under sail and that we never ran the port engine. It could have been way worse. Now, the only sacrifice, other than Mark’s creepy underwater experience, was the loss of one of the snorkelling fins during the buoy recovery operation. As for the status of our relationship with the crab pot... Well, it’s all about give and take. We feel like we did both, and we like the taste of crab, so we’ll just be on our guard and treat the pots with respect.